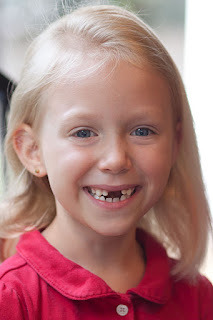 CC lost another tooth on Saturday morning (once again, waking up to find it in bed with her). That brings her total to six, and now that both her top middle teeth are gone, she's adorably toothless. Just in time for school to start! For the first time, the Tooth Fairy did not come! CC sobbed while I hugged her, and MJ and I did a bit of silent finger-pointing behind her back. But CC decided that the Tooth Fairy must have been really busy that night, and maybe she would come while we were at church. Sure enough, we came home to find not two but three dollar coins under her pillow! I was so proud to hear CC say, "The Tooth Fairy must have wanted me to share!" And she gave one to each of her siblings.